The lakes and rivers of the Columbia Valley are much warmer than elsewhere in the Canadian Rockies, but for visitors from warmer climes, the water is still considered cool for swimming, even on the hottest summer days. The following swimming spots are listed from north to south. The town of Invermere is at the north end of large and busy Windermere Lake. The area was the site of an 1807 trading post set up by David Thompson to trade with Kootenay (a small plaque along the road to Wilmer marks the exact spot) and the original lakefront town site is now a popular recreation spot, where a pleasant grassy area dotted with picnic tables runs right down to a sandy beach and the shallow waters of the lake. 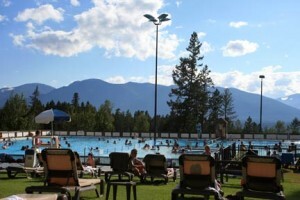 A short distance south from Invermere is Fairmont Hot Springs, comprising a sprawling residential and resort complex, three golf courses, a small ski resort, a strip of shops and restaurants, and an airstrip. Despite all the commercialism, the hot springs (5225 Fairmont Resort Rd., 250/345-6311 8 a.m. to 10 p.m. daily, adult $14, child $10) are still the main attraction. Their appeal is simple: Unlike most other springs, the hot water bubbling up from underground here contains calcium, not sulfur with its attendant smell. The pools are a magical experience, especially in the evening. Lazily swim or float around in the large warm pool, take to the diving boards of the deep pool, or soak away your cares in the hottest pool. Continuing south, the Canadian Rockies open up and the scenery becomes more pastoral. Five kilometers (3.1 miles) south of Canal Flats, an unsealed logging road takes off east into the mountains, leading to 1,994-hectare (4,930-acre) Whiteswan Lake Provincial Park. The road climbs steadily from the highway, entering Lussier Gorge after 11 kilometers (6.8 miles). Within the gorge, a steep walking trail descends to Lussier Hot Springs. Two small pools have been constructed to contain the odorless hot (43°C/110°F) water as it bubbles out of the ground and flows into the Lussier River, but otherwise the site remains in its natural state and there is no admission charge. Unlike the several backcountry parks in the area, 144-hectare (360-acre) Wasa Provincial Park, 30 kilometers (19 miles) north of Cranbrook, is easily accessible along Highway 93/95 north of Fort Steele. The lake is warm, making for good summer swimming. The park encompasses a number of sandy beaches scattered around the east side of the lake, but all are linked by an eight-kilometer (five-mile) paved walking and biking trail that encircles the lake. The lakeside campground is one of the most popular in the valley.